Are you ready for the 2020 shift? As Australia transitions to a new coordinate system, there are a few key considerations for the landfilling industry to ensure it is prepared for change, writes Ray Cox of Landair Surveys. There are many instances in the modern world where foundational elements of a system are taken for granted. For example, most end users overlook the background coding necessary to view a website or use software. However, coding is what the system is built on and is necessary for user interaction. Similarly, coordinate systems are the foundation for most landfill operators. So what happens when the foundation needs to shift? The Federal Government agency – Geoscience Australia is in the process of transitioning the nation to new coordinate systems with compliance required by the year 2020. 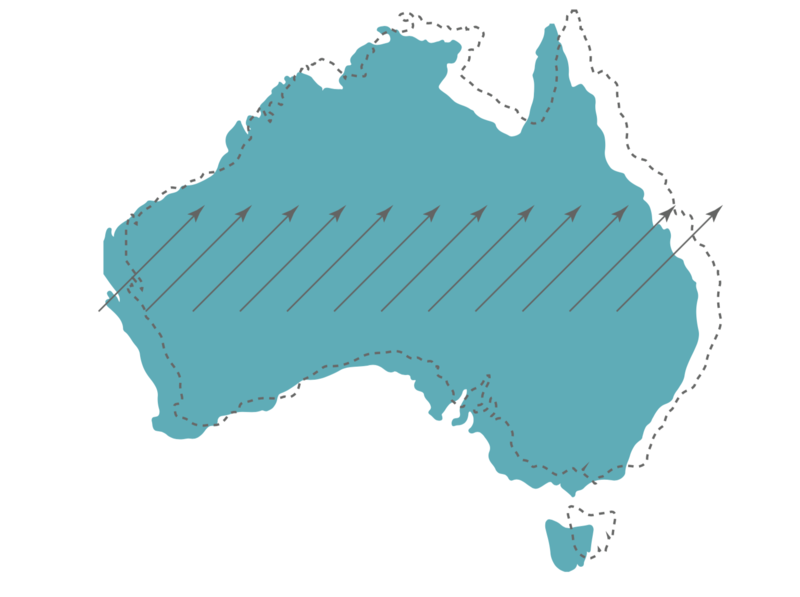 The new framework, known as Geocentric Datum of Australia 2020 (GDA2020), has the corresponding map grid coordinates listed as Map Grid of Australia 2020 (MGA2020). So why are we shifting to new coordinates? There are two key reasons – continental drift and improved satellite-based positional accuracy. Australia is situated on one of the world’s fastest moving tectonic plates. The Intergovernmental Committee on Surveying and Mapping (ICSM) has measured this drift as seven centimetres per year towards the north-east on the world map. Seven centimetres seems minimal but the cumulative effect adds up. By the year 2020, coordinates will be 1.8 metres different from their original position set in 1994. GDA2020 recalibrates coordinates to their true position as at 1 January, 2020. The second reason for change is improved accuracies available from Global Navigation Satellite Systems such as GPS. In the late 1990s, the rise of satellite technology required Australia to update its mapping framework from a local to global scale. Instituted in January 2000, GDA94 and the corresponding MGA94 coordinates aligned Australia with international standards. Since 1994, additional countries have launched satellite systems that are also used to increase positional accuracy. When GDA94 was instituted, ‘uncorrected’ GPS positions had a relative accuracy of around 10 metres which made edits for continental drift meaningless. Imagine a future scenario where an autonomous vehicle using sub 10 centimetre true satellite positioning travels down the footpath instead of the road because boundary linework is referenced to a 1994 position. That’s what GDA2020 is trying to avoid. But what do the geographical changes mean for landfill operators? Firstly, the changes are already underway. GDA2020 was formally gazetted by the Federal Government in October 2017 as the official mapping datum. Government departments and legal frameworks will transition to GDA2020 within two years. All ongoing landfill operators will also need to comply and it’s a case of when – not if. Secondly, operators will need to know their coordinate systems. It will be common for many landfills to have data on three differing coordinate systems. Pre-2000 data will be aligned to AMG66 or AMG84 coordinates and differ approximately 200 metres to MGA2020. Data post-2000 up to 2020 will usually be aligned to MGA94 coordinates and differ 1.8 metres from MGA2020. This small difference will catch a lot of people out because it is small enough to pass undetected and could result in construction and infrastructure being incorrectly positioned. Thirdly, it is important to proactively set up or outsource an effective spatial data management system. All the necessary pre-2020 data will need to be calibrated to GDA2020 for future use. Having a single, point of reference file – as Landair provides its clients – aligns all of a site’s spatial data to a common coordinate system. This file then becomes a very important decision making and reference tool. The transition to GDA2020 will present challenges to landfill operations, but with the right tools in place, the foundation shift can be effectively managed.